Rugged Donegal in the far northwest of Ireland is unknown territory for many Irish people whether by land or sea - and even more so for people from further afield writes W M Nixon. Yet for people who live in this picturesque but challenging region, it’s the hub of the universe, and for Donegal-located sailing enthusiasts, it can be a cruising paradise. This was brought home to the rest of us at the recent Irish Cruising Club prize-giving, when the Glengarriff Trophy for the best cruise in Irish waters went to Dr Paul McSorley, who sails from Lough Swilly. Despite 2015’s mixed weather, he made a very detailed cruise of the Donegal coast with his daughter Eimile in the 27ft International H Boat Wild Cat. While the H Boats were developed in Finland as a fast weekend cruiser with genuine race potential (they’re now an International Racing Class), it’s unlikely that designer Hans Groop envisaged them cruising the monumental Donegal coast with its challenging location on the Wild Atlantic Way. Whatever, there’s no doubt that Donegal is a special place for many cruising folk, and in recent days the ever-curious Norman Kean and Geraldine Hennigan of Courtmacsherry, who edit the Irish Cruising Club Sailing Directions, have been in Donegal sussing out welcome new developments. In a sense, it was something of a home-coming, for when Norman first came from Scotland to settle in Ireland to work in a chemical plant in Derry, Lough Swilly Yacht Club became his home base, and it was a cruise from there to the Faroes in an own-built Sadler 25 which first put him on the cruising map. In Donegal in late February 2016, they found that the further you go south, the more promising are the developments. Best of all is the mighty fishing port of Killybegs on the south coast facing into Donegal Bay, a wonderful natural harbour for a bustling place which is said to be a town of 23 millionaires. For although not everyone does well in the fishing, some busy and innovative types do very well indeed. For quite some time there’s been talk of the provision of pontoon facilities in Killybegs, but for 2016 Donegal County Council - where Cathal Sweeney has become the enthusiastic harbour engineer - have just gone ahead and done it with a minimum of fanfare, installing a 63-berth pontoon setup with plenty of room for expansion. (As first reported by Afloat.ie in March 2013). The pontoons were supplied and fitted by Oliver Shortall's Inland and Coastal Marinas Ltd of Banagher in County Offaly. At present it’s called a “Small Craft Harbour”, which at first you might think reflects the reluctance of local authorities, the further north you go in Ireland, to describe a new amenity of this type as a “marina”. 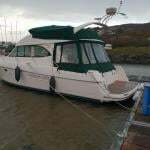 A case in point is Ardglass in County Down where the excellent little marina – one of the greatest boons to East Coast cruising – is still referred to as the “Phenick Cove Boat Park”. On the other hand, Cathal Sweeney sounds a no-nonsense kind of guy, so maybe he won’t describe the very welcome new facility in Killybegs – which will transform Donegal as a cruising ground in providing a convenient base where a boat could be confidently left with good if distant communications with the rest of the country – as a marina until it has the full shoreside facilities. Then the cruising options from Killybegs have been improved too, as to the westward a fine big pontoon has now been provided at the west pier in the lovely inlet of Teelin right beside the majestic cliffs of Slieve League. But then as we head north along the massive Atlantic seaboard, proper facilities are sparse enough, though in the case of both Burtonport and Bunbeg, it’s surely only a matter of time before a proper recreational-use pontoon or two gets installed. Cruising Donegal’s north coast, it still remains a source of wonder and delight that Tory Island now has a proper pier, albeit a tiny one, at which a cruising yacht can confidently overnight. 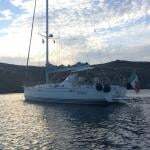 And further east we hear that the most sheltered anchoring spot on the entire north coast, Fanny’s Bay on the west side just inside the entrance to Mulroy Bay, is a real possibility for a small marina facility. Nevertheless in cruising Donegal, your first requirement is for your vessel to have her own fully operational and very substantial ground tackle, for apart from this being the seamanlike approach, the choice of anchorages which opens up when you know you’ve an anchor which will hold, and a windlass which will retrieve it, is almost boundless. In the northeast of this enormous county of Donegal, there has of course long been a convenient if somewhat tide-ridden pontoon at Rathmullan on the west shore of Lough Swilly, but across-lough at Fahan, the marina – the great white hope of Donegal sailing – continues in a sort of semi-functional limbo, an unfinished, disconnected piece of work which nevertheless gives enough hint of what might be, if only someone could find a way through various legal and commercial impasses. Up to the north of Inishowen, what was hoped to be a “marina” at the lovely little bay of Bunagee at Culdaff has seen its pontoon damaged in winter storms, for even in summer this is a restless if attractive anchorage. But on the east coast of Inishowen the Greencastle-Moville area has seen significant improvement with summer harbour for Moiville Yacht Club close south of Greencastle, where the main harbour itself has seen work resumed on some improvements. So Donegal calls. It may get some of the roughest weather in Europe, but when summer comes to stay for a week or two, it’s a cruising paradise.